WeSellCrypto.com (or previously known as WeSellDoges.com) still might be one of the best websites to buy crypto currencies from. Why? Because they go beyond selling crypto currency and work towards helping the community grow. The internet and forums are littered with mostly excellent reviews about their service and how they operate using PayPal as their payment option. PayPal is a payment platform that is not only familiar with the tech savvy audience but even the average Joe knows about it! This is one of the reasons why the website has gained a good reputation in selling crypto currencies. 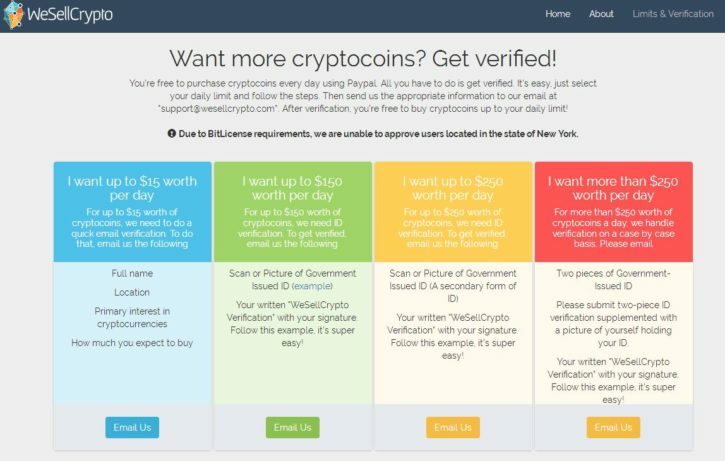 This project was actually something that Greg Cronheim, owner of WeSellCrypto.com thought of creating due to the surge of crypto currency scams way back in 2013-14. He then connected and shared his architectural design with David Larsson, a developer and crypto enthusiast from Sweden and within three weeks, a working prototype was ready for release. They have been operating since 2015. 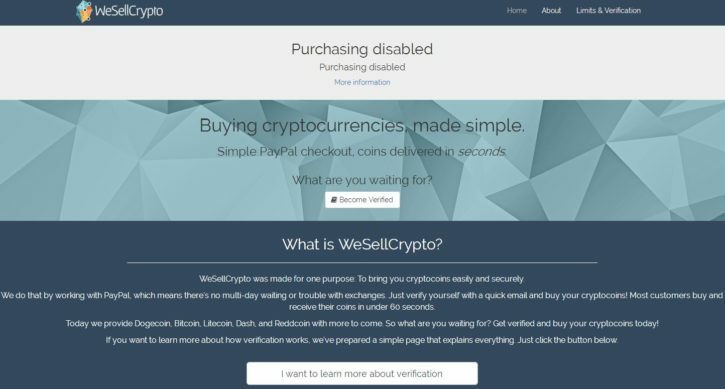 As of this moment, WeSellCrypto is having inventory problems and they have disabled purchasing on their website. A thread created by Greg Cronheim himself in Reddit explains why they are running out of coins. On the post, he also mentioned that all the funds would clear every Mondays through Fridays around 5 PM (1700) Eastern Time. This is the time when their website will re-open their inventory for the available inventory on that day. If they ran out of stocks over the weekend, they wouldn’t replenish funds until Monday. The verification process is quite unique and entertaining to a point. Not to mention, they have a clear representation of what you can get on the limit that you are planning to conduct business with them. Shown above on the screenshot, you have options from a $15.00 limit per day and on the far right, the maximum would be more than $250.00 per day. This means that you can choose from (4) four limits depending on how much you would need crypto currency on a daily basis. Below each limit, you would have the requirements that you need to send to their email support@wesellcrypto.com. Please see the example below for the $15.00 verification limit. Type in the provided email address for verification and include the information needed. Most of the time the verification averages 2-3hrs but expect it to reach 24 hrs before being verified as this is done manually. In addition, please make sure that you will be using the email address that is connected to your PayPal account. Verification over the $15.00 limit would require you to forward a Government issued ID. If you are not confident in giving personal information over the internet then do not go over the fifteen dollars daily limit. Verification limit means that you are unable to purchase anything above your limit on a daily basis. These are the crypto currencies that WeSellCrypto.com sells. 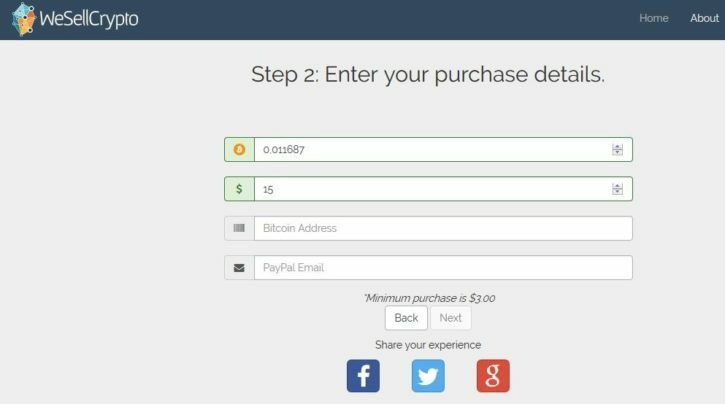 The minimum purchase would be $3.00 per transaction and the maximum would depend on your verification level. Fees would then be automatically calculated and you wouldn’t have any views on how much they will charge you per transaction, aside from the charge coming from PayPal. They say that WeSellCrypto.com charges way above the normal market price of crypto currencies and that they tend to sell 15% to 20% above the normal market price of coins. All you can see on their website is how much they are selling Bitcoins/crypto currencies for. This gives them enough back in PayPal fees and over-head expenses that cannot be avoided. Once decided, you then type in your desired amount to purchase. Take the screenshot above as a sample showing USD $15.00 purchase price, you would get 0.011687 BTC on the time this screenshot was taken. They are not selling cheap coins, that’s a fact. What they are selling is the convenience of you having to use your PayPal account to buy coins. Their website is pretty straight forward as you do not need much when it comes to websites selling crypto currencies. They purely sell coins and do not participate in any trading within their website. People cannot even sell their crypto currencies here, all they can do is buy it. This might also be the reason why they currently have a coin shortage problem. It’s pretty straightforward actually; you just need to choose which coin you need on that day and proceed to checkout. No fuss, no hassle and you would get your coins almost instantly. There are a few people that experience delays in getting their coins, but it looks like that this is due to the inventory issues they are experiencing at the moment. Customer support with WeSellCrypto.com would come in email customer service. This method might not be ideal for everyone as email customer service would usually be resolved within the next 24hrs and not instantly. Good thing that Greg is really active when it comes to his Reddit posts and this is where more than half of the customer service is being handled by the owner himself. When it comes to information security, you would be submitting personal information over the internet if you want to get verified over the $15.00 daily limit. Though this might just be a way for them to check the validity of their customers it might still be a risk sending information through. If you are a person that wants to keep this information safe and away from possible identity theft then you might want to think it over. They, of course, claim that they wouldn’t store any personal information on their servers. Have they been hacked previously? Records show that their previous domain was hi-jacked.You can read about what Greg and David had to say about the issue in this thread. The hi-jack happened around two years ago in 2015; the same time when they were just starting and fairly new to the market. With regards to their new domain which is WeSellCrypto.com, there aren’t any claims or posts regarding them being hacked, again. The team behind WeSellCrypto is really doing a great job when it comes to operating their company. Crypto currency exchange was started with the support of the community behind them. Without the community, these coins would be worth nothing. Just like what they are doing, almost all of forum posts about WeSellCrypto, Greg or David would be there sharing their thoughts about the issue or topic. I’m not saying that you should trust them because they have a heart; but always do your personal research before buying coins from any website out there today, especially when your PayPal account and personal information is involved. Trading Fees None, they sell high. Withdrawal Fees None, you pay their crypto price and that's it, aside from PayPal charge.